It may seem logical to assume that we all share the same urban space: cyclists, pedestrians, drivers. But that’s certainly not how people feel, and most urban design doesn’t seem to resonate this idea either. How many drivers do you know have you heard criticizing cyclists, complaining that they do not respect the rules of the road? Or likewise, how many cyclists complain that drivers do not make their preferred form of transport a particularly easy one? These sorts of attitudes show us that many regard other road users as being something of a nuisance. They share the same space, albeit reluctantly. Designers, researchers, and engineers are beginning to answer the question of how we should be sharing and using the same space, resulting in radical new designs that not only change the way our cities look, but how they feel. The crossing in Oxford Circus is an example of such a design, and concepts such as shared space are looking at ways of re-imagining the relationships of road users. Does an urban space that removes features such as traffic lights, barriers and signs sound like a good idea? While controversial, it is precisely ideas such as these that will have the ability to shape our spaces for the better. While it might seem counter intuitive, removing the standard signals we’ve begun to expect (such as traffic lights or signs) and simplifying streets, provided the right “social messages” are being conveyed to street users - the safer streets became. Let’s take a closer look at a recent example of shared space. The street is patterned with criss-crosses in the paved surface, denoting that it is an open space, welcoming of pedestrians. There is a lack of clutter, and the slower pace (from the reduced speed limits) affords the space a more pleasing, relaxed feel. However, the street is still plagued by issues that are holding it back, such as traffic congestion, demonstrating that heavy traffic is certainly not a problem of the past. And there are still signs of segmentation, such as benches appearing in pedestrianised areas away from what could be considered to be a traditional road. Future projects such as like this need to stay true to their original vision and aims. How can we ever evaluate the effectiveness of shared spaces if compromises to the stated goals are being introduced? It can't help either that ‘pure’ shared spaces attract so much opposition from charities (and those who they represent) such as Guide Dogs. Any scheme that appears to be worsening the accessibility of our roads is going to have a hard time being approved, at least without alterations. Are shared spaces the future for our streets? Do you think features such as pedestrian-controlled crossings are required for full accessibility in shared spaces? Would you consider Exhibition Road to be a success, and why? Evaluating Performance - Exhibition Road Monitoring. This report, published in August 2012, aims to provide a qualitative assessment of how users of Exhibition Road interact with each other. Thinking Streets. 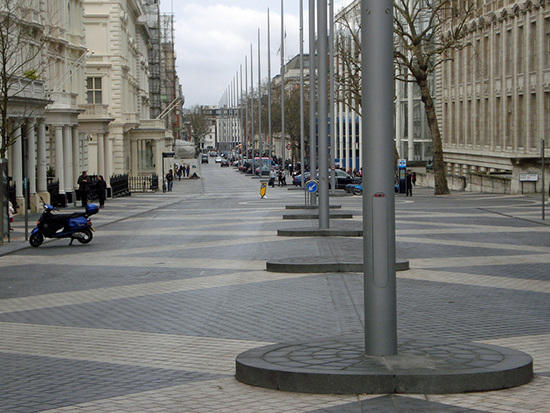 The BBC radio 4 show looking at shared space is an interesting, if slightly one sided, listen.